Victor Frost has worked as a professional audio engineer for the last ten years with organizations big and small. Being a performer at heart, he has lectured at geeky conventions all over the United States on a wide variety of subjects but, most frequently, on the use of sound in popular works. 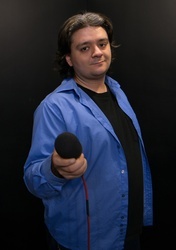 Victor is a graduate of California State University Northridge with a Bachelor's degree in Cinema Television Arts with a focus on Radio Production. He now runs a production company in Los Angeles, FrostWorks, which is dedicated to producing eclectic, educational, and entertaining media.